Live…Love…Eat…Dream…Fukuoka! A blog about how to see Fukuoka through the eyes of a local and the curiosity of a tourist! Dazaifu City is the historic capital of Kyushu Island where it was governed for more than 500 years some 1300 years ago. 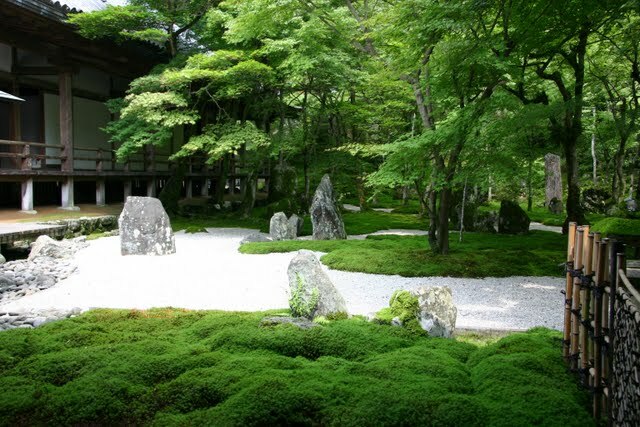 It is therefore a must-see destination for those interested in Japanese culture, history and nature at its best. This city houses the most popular tourist attractions of Fukuoka Prefecture and a visit to Fukuoka is not complete without taking that trip to Dazaifu to visit its famous shrines, gardens, and immerse oneself in Kyushu’s culture. 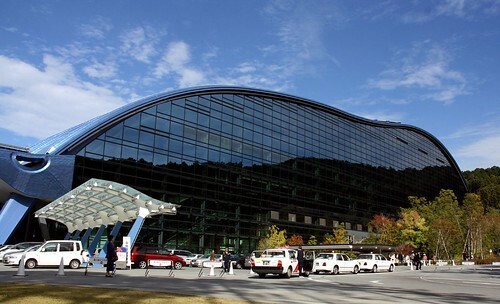 It is no accident that one of Japan’s three national museum is here. 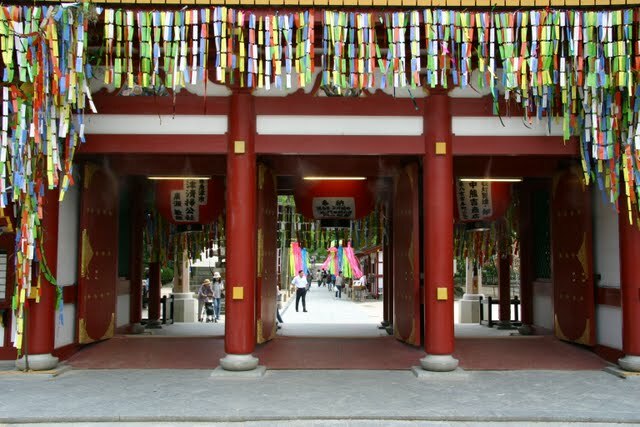 Dazaifu Tenmanguu Shrine is probably the most famous tourist attractions in Fukuoka Prefecture. It enshrines Michizane Sugawara (菅原道真) a high ranking government officer who served the emperor but who was sent into exile to Kyushu. His miserable life being away from his family is described in the legends along with his talent and pure heart. Thus, the shrine is now famous as the enshrining the god of academics as he was known as the “God of literature or calligraphy”. 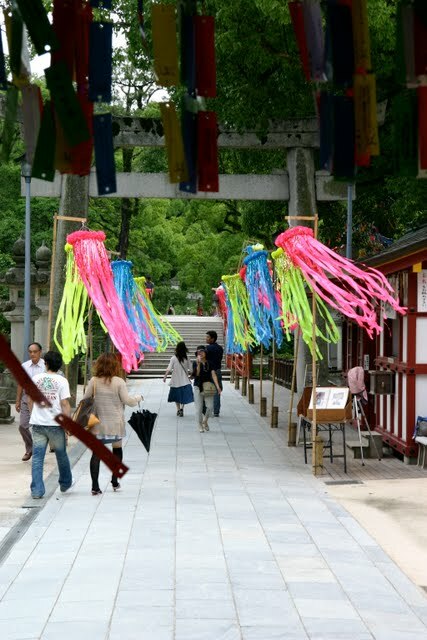 Many people visit this shrine to pray for successful entrance examinations and job applications. 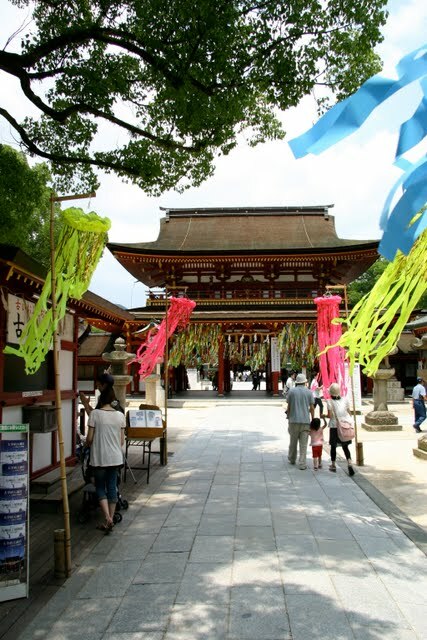 During the New Year season (1-7 January), Dazaifu Tenmanguu Shrine is ranked one of the most crowded places in Japan. This is when many Japanese visit as part of their New Year’s tradition, and it is also right before school entrance exam season. If you are strong enough to survive such crowds and cold weather, we suggest immersing yourself among the hopeful students and New Year revelers during the countdown to the new year. It is certainly a unique and spiritual way of celebrating the New Year in Japan! Snow settles on the roof of the shrine’s eastern entrance in winter. For Fukuoka locals like Asawa, the shrine is especially spiritual and memorable. She was taken to this shrine when she was one month old for Omiyamairi (first visit to the shrine) and also for Shichi-go-san (a Japanese custom of bringing children aged 3, 5, and 7 years to a shrine). To make it more special, this is also where Asawa and Kaeru got married! 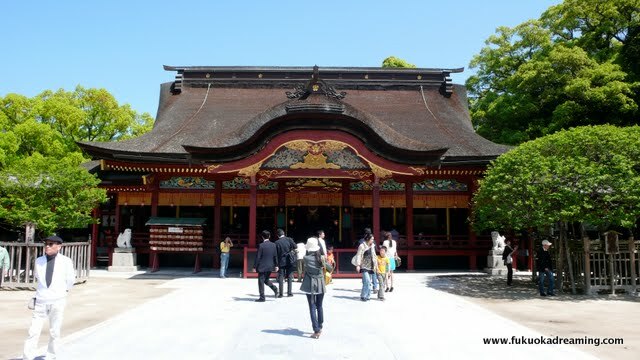 Dazaifu Tenmangu is a 5 minute walk from the Dazaifu Train Station. Walk right through a pedestrian street lined up with shops until you reach the end. To your left will be three bridges, representing the past, present and future which cross a pond shaped in the Kanji for “heart”. Cross these bridges to get to the main hall. The superstitious should avoid crossing the bridges together with their significant others as some believe that doing so will lead to break-ups! The other person can pass through either side of the pond instead! Asawa and Kearu have never crossed the bridge together! Better be safe! The garden’s summer colors aren’t that bad either. One of only four national museums in Japan, and the first in over a 100 years, the Kyushu National Museum is just a short distance (by a really long escalator) from the other attractions in Dazaifu. It hosts a permanent collection featuring Kyushu island’s (and therefore Japan’s) rich history as well as temporary exhibitions in the other halls. A visit to the permanent section would probably require at least 2 hours for a truly interested person, so make sure to arrive in Dazaifu early to have enough time to visit all the sites. 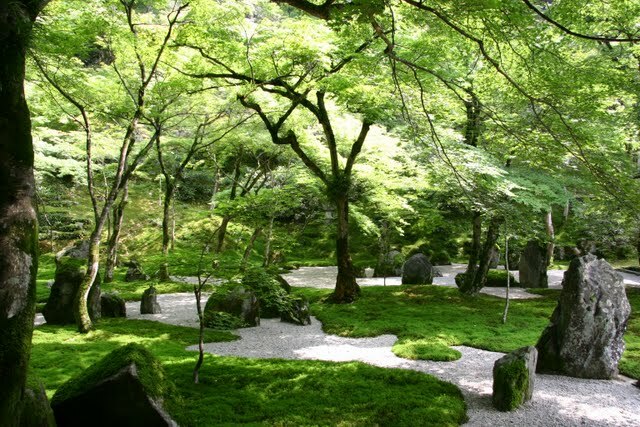 Other significant places to see are the former site of the Government Office (都府楼跡 Tofuro-ato), Kanzeonji(観世音寺), Kaidanin(戒壇院) and other ruins from 7-8th century located near Nishitetsu Tofuromae Station(西鉄都府楼前駅). These are on the opposite side of the train station compared with the first 3 sites. You must eat freshly grilled Umegaemochi (梅ヶ枝餅), available at many shops in front approach street to the shrine and the cafes in rear approach. There are many shops selling this but the price and the base are the same. The most popular store selling this seems to be Kikuchi. It commands a long line everytime we have been there (photo). Also basic Japanese food such as Tenpura and Udon/Soba are available at many restaurant around the Shrine. this site. I am hoping to check out the same high-grade blog posts from you in the future as well. If you would like to increase your knowledge simply keep visiting this site and be updated with the most recent news update posted here.